Welcome To The Shakin 'N Bakin Blog! Welcome to my blog! I love to cook and bake for my family. I hope you enjoy the recipes, foodie reviews, foodie giveaways and cooking tips posted on my blog. How to Print Recipes: You can print out each individual recipe featured on this blog by clicking the "share" button at the bottom of each post. It will open up to show you options, click on print and another window will open up with the recipe inside it for printing. You can also use the SHARE button to email a copy of the recipe to yourself for printing later. We are now officially into the second week in December and that means we’re officially in holiday season! Kitchens are beginning to fill noses with the scent of warm, homemade cookies, breads, pies and cakes! 'Tis the season to be eating good! I have the perfect list of sweet treats to help you avoid walking into a holiday gathering empty-handed. Whether you’re prepping for a cookie exchange, planning a day of baking fun with kids, or looking to wow the crowd, the Pillsbury Doughboy has this season’s ultimate guide to cookies that are easy and delicious for any holiday occasion. The great folks over at Pillsbury sent me a VIP coupon to pick up a package of Pillsbury Ready To Bake!® Chocolate Chunk & Chip Cookies which happens to be my favorite type of cookies to enjoy! You can find these in the refrigerated section at your local grocery store. Once home, just store them in your refrigerator until you are ready to do your baking. My mother was visiting me early this morning and she decided to pop them into the oven for me. There is no mixing of batter, no gathering ingredients and no mess! You simply preheat your oven, put them onto a baking sheet and within 10-12 minutes your first batch of cookies are ready to enjoy! Now...that is my type of baking! To be honest...mom and I are both little piggies when it comes to homemade cookies and we had a 1/4 of this batch devoured by lunchtime! They are delicious and really chewy which is the way I prefer to have my cookies! There is just enough left for me to enjoy some later tonight with my cup of hot cocoa before bedtime. 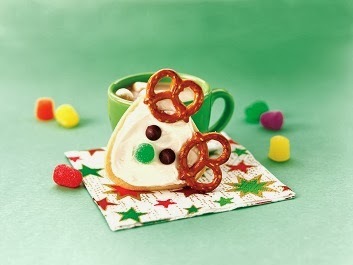 You can count on Pillsbury to help you get all of your holiday baking accomplished this year. You can purchase refrigerated cookie dough to save time or you can head on over to the Pillsbury web site and browse all of their delicious looking cookie recipes. So let's hear it...what is your favorite holiday cookie to enjoy during this time of year? Disclosure: Information, photo and review product (cookie dough) was provided to me free of charge by Pillsbury for this post. No monetary compensation was received. This blog is copyright protected 2007-2016 by Shelly owner of Shakin and Bakin Foodie Blog. All Rights Reserved.